By buying this product you can collect up to 20000 loyalty points. Your cart will total 20000 points that can be converted into a voucher of 0. 2. Standard: The shell fabric accord with EN531 and ENISO11612. 3. Certificate: ISO9001: 2008, EN469 certificate and test report of National Fire Equipment Quality Supervision and Inspection Center. 4. 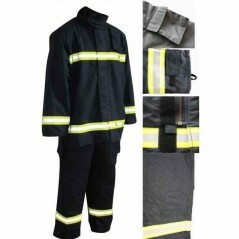 Application: Basic protective garment for fire fighting. 5. Special property: Flame retardation, heat-resisting, waterproof, permeability, comfortable inner, the outside facing component layer having static electricity prevention, acid-resisting and alkali-resisting, high temperature preventing, good thermal stability, etc.